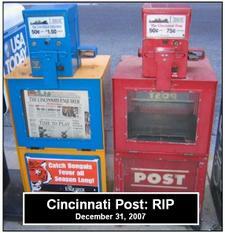 Today the 126-year old Cincinnati Post and Kentucky Post published its final issue. This is no small deal, and even the New York Times gave the matter half a dozen column inches this morning. 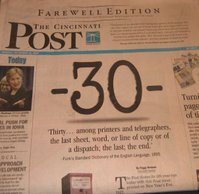 Admittedly,I wasn't a huge reader of the Post, but it's hard not to feel bittersweet, even a bit nostalgic, about its exit. Indeed, earlier today I couldn't resist cruising around the streets of Cincinnati to capture the paper's last breath of circulation in action. Regrettably, after visiting nearly a dozen stands, I only found one that had copies of the new edition. Here's a photo gallery from my journey. While Cincinnati is now a "one-newspaper," I'm probably stop short of using the word "consolidation" to describe what's going on. With the advent of blogging and other forms of CGM, it's just not that simple anymore. Indeed, media continues to fragment everywhere, and the challenge for print publications is to not only harness the digital space an extension of what they do well offline, but also to co-create content with consumers and readers who bring new skills and capability to the table in the event capture and packaging department. Easier said than done, of course, but there's experimentation taking place among newspapers on this front, even here in Cincinnati, with the Cincinnati Enquirer exploiting "expert moms" as part of program called CincyMoms. Local TV stations are also getting into the act, and there's no question we'll see in 2008 a further blurring of the line around "who owns local content" question. Never a dull moment! And so "The Post" wraps up my final post of 2007. Happy New Year! I just noticed the Wikipedia entry for "Consumer Generated Media" is finally starting to take shape. That's an encouraging 2007 development, and I hope 2008 sees further definition and elaboration (and supporting links) against this important trend and concept. I've pretty much sat on the sidelines watching as the definition evolves, and it's quite fascinating. In the early phase, it was quite obvious that the Wikipedia entry-elite (another 2008 buzzword?) 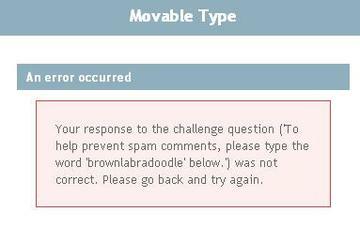 were not too fond of the term "consumer" versus "user" or "people," and at once point someone suggested folding the entry into the User-Generated Content entry. Fortunately, CGM passed that test. Early on, someone also noted on the entry that I wasn't the first person to use the term, which appears to be true. Turns out someone did in fact use the term before I did, but in an entirely different context. Still, there's a beautiful accountability principle at work with Wikipedia that constantly keeps us on our toes. This form of "group CGM" drives transparency. Lastly, it's pretty obvious that a growing number of folks are linking to the entry as it now owns the #4 position on Google against the query "Consumer Generated Media," up significantly from a year ago.